Todays mani is based off of the book I am writing and posting on wattpad called Be Your Everything. I have always loved writing and I have always done it. For years I have found it so hard to find a happy book, a light read, something non-depressing, and something appropriate to read. In my mind when I am going to sit down and read a book I want to get up with a smile on my face. I want it to leave me in love with the characters and wanting more. Just have it be a little escape rather than having it be something that can put you in a not so great mood. So Be Your Everything is basically the book I wish I could go and find in stores. One that any age can read, and not have to worry about having any parts some parents would want their kiddos to skip. Now to explain the pineapples without giving a way the books. Ha! So the book takes place in a realistic fictional place that I have created that would be in Florida. The book starts in North East Florida in a real town and there are places that I mention that if you were in NE Florida you could look up and actually go visit. However then it ends up beings set on an island named Summer Haven which is not real (but I so wish it was). The island is the where a majority of the book is set and its probably one of my favorite things about the book. Without giving to much away there is a part in the book which explains how Summer Haven came about. That part wasn't something I had thought of in the start of working on this book and now that part of the story has become with one of my faves. Anywhoo as the book goes on Pineapples start showing up all over the place. A house in the book has pineapples in the decor and in outside and around the house as well which will later on become quite an important thing that will reoccur. One of the bedrooms in the house is all decked out in pineapples, which is the bedroom that is nicknamed the Pineapple Room. As I have worked and am working on this book I am actually using Pinterest to pin what I imagine the house and other things in the book look like. 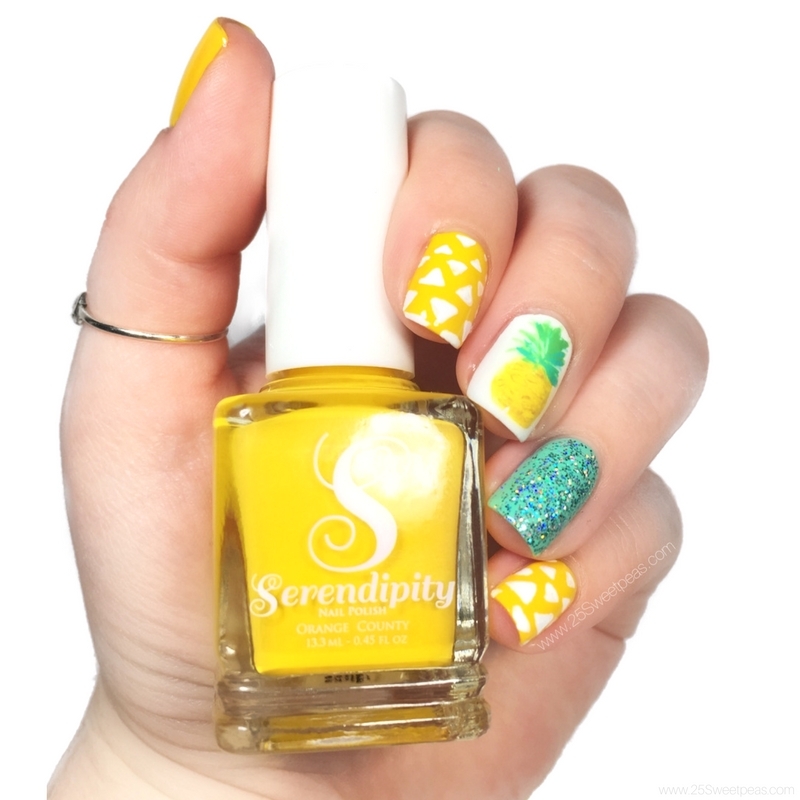 So for this pineapple bedroom I have found a particular bedding set which I have pinned HERE, and its what I based these nails off of. This pinterest board to go with the book is one of my features along with the playlist I also have to go with the book. Basically it allows the readers to see what I am thinking in the book, and kind of hear the music I am listening too while writing and the songs I think are fitting for the story line. Plus it also allows me to find other ways to go get excited about the book if/when I hit a dull patch and don't know what I want to write. I haven't worked on the book very much this past month, and after working on typing it again, and going through the pictures it really makes me want to just write more. Plus summer allows me to go more places and going to the beach, and little beach towns and local events really just makes me want to work more on it. Now if you have actually just read all of that thank you so much! It means a lot to me. I know this mani was a stretch for the theme but I've just been really excited about this for a bit, and I've wanted to kind of just chat about it too. So it seemed like it would work for todays post. 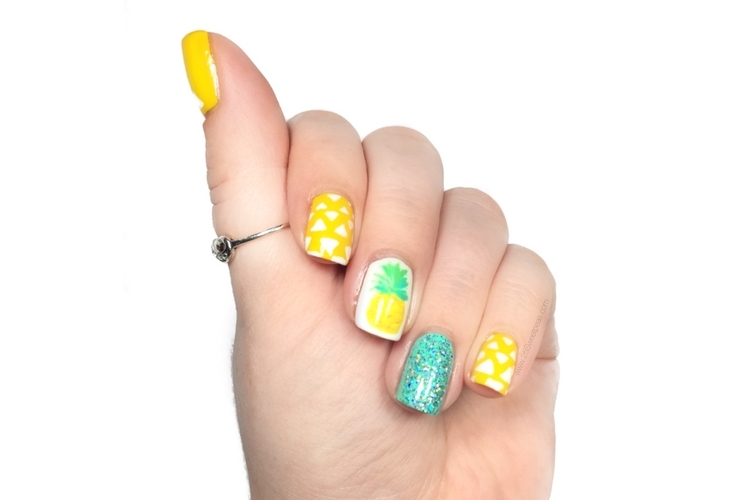 :) Plus pineapples are just becoming a symbol in the book that I am just loving that I could paint a bit of it on my nails. I hope you have enjoyed this post and this weeks art in general! I have some swatches of a new amazing collection very soon, and I also should have a new video this weekend! So lots to do and be excited about! I will talk to you all tomorrow! Haha, of course you had to figure out a way to bring in pineapples to the theme! Love it! But of course!! Its becoming a thing! Haha!!! This mani is perfect! I love that you used Pinterest to map the house out. :) I'm excited to hear more about your book - I love happy books too! I love that you are writing a book and that pineapple is SO CUTE!